WATERFRONT PARK – Waterfront Park is located in downtown Sister Bay and affords a spectacular view of the bay. A brand new expanded swimming beach is available, and amenities include a gazebo, restrooms, playground equipment, picnic tables and benches, charcoal grills, and a “quite craft” launch area. 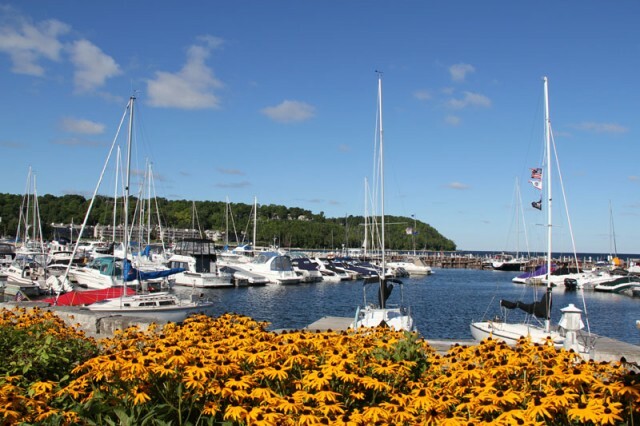 Waterfront Park was recently expanded and the Village has now created public access to 1,936 linear feet of waterfront property, which makes it the largest expanse of any such property in Northern Door. There is a designated tented event area in Waterfront Park, and it is frequently the site of large wedding receptions and special events. MARINA PARK – Marina Park is adjacent to the Village’s Marina. Amenities include grills and picnic tables. Marina Park also affords a spectacular view of the bay as well as the Marina. Tents which are large enough to accomodate 100 people can be erected in Marina Park. THE VILLAGE SPORTS COMPLEX – The Sports Complex is located on Autumn Court. Improvements continue to be made at that facility as Village officials would like to see it utilized to the fullest extent. Little League and T-Ball games take place on a regular basis at Louis Michael Hanson Field, the Sister Bay Bays call the fully equipped baseball field and pavilion “home”, and the tennis and basketball courts are available free of charge on a “first-come first-serve” basis. Volleyball nets are also available. Welcome additions to the Sports Complex are the full-size and micro soccer fields, which get a lot of use during the soccer season as well as the skateboard park. THE VILLAGE HALL – The Village Hall is located at 10693 N. Bay Shore Drive and is the perfect location for a number of different events and activities ranging from art shows, meetings, plays and concerts, exercise classes, and the like. It is equipped with kitchen facilities as well as a stage. THE SISTER BAY-LIBERTY GROVE FIRE STATION – The Sister Bay-Liberty Grove Fire Station is located at 2258 Mill Road. There are two meeting rooms in the fire station – one which can accomodate large groups and one which can accomodate up to 12 people. It is possible to rent all of the previously mentioned parkland and facilities. Since the Sports Complex is getting a lot of use it is highly recommended that anyone wishing to utilize it check on field availability well in advance of any scheduled activities. For complete reservation information or if you have any quesitons regarding a particular park or facility please contact Janal Suppanz at 920-854-4118. Before any reservations are finalized a completed Facility Use Application must be submitted along with the required security deposit and use fees.